LaCie revealed a pair of HD multimedia players this week that are soon to hit the market. The LaCie LaCinema Black PLAY and LaCinema Black RECORD have a maximum video output resolution of 1920 x 1080p and support a slew of video formats and codecs. Both models come with an option of a 500GB or 1TB hard drive, wireless network support, HDMI and component (YUV) output, and USB 2.0 interface. The LaCinema media drives let you view media from networked computers via wireless network or ethernet port. 1080i upscaling will improve playback of your standard definition videos on your HDTV. 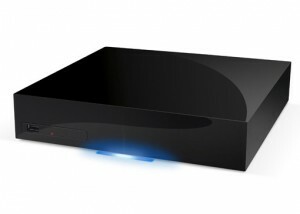 The LaCie LaCinema Black RECORD comes with all the features of the “PLAY” model but with the ability to record content. You can pause and rewind live TV and record programs to watch later. The model’s “time shift” capability allows you to record a show from the beginning even after you have started watching it. Another cool feature of the LaCinema “RECORD” allows you to transfer and view footage from a camcorder. Both LaCie LaCinema models come with a 2-year warranty. A starting price of $399 has been rumored although LaCie says they will be coming out with new pricing on both models soon.